Sooner or later, they can’t deny it any longer. They get out of bed and start getting dressed in workout clothes and tennis shoes. It’s early, and the sky is still a dark, morning blue. But they are smiling, knowing their friends are also challenging themselves to get up early and start the day with a workout. 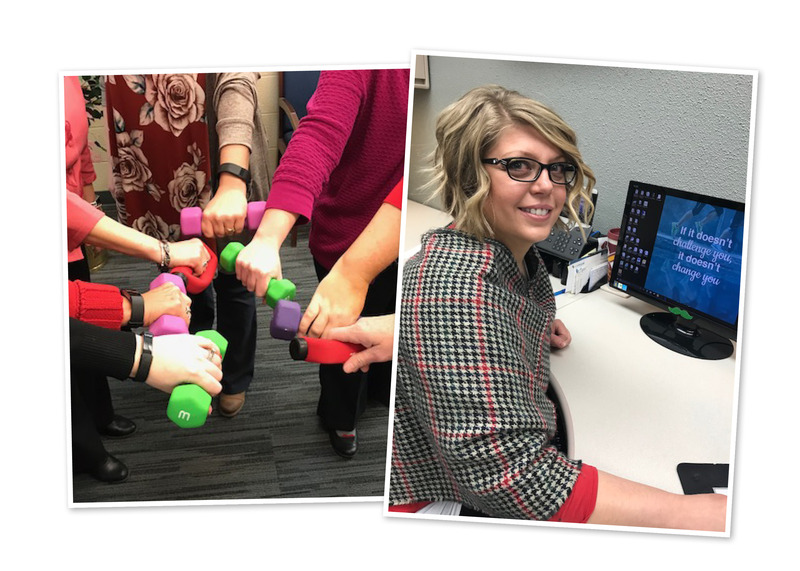 The routine started in January 2018, when Loan Assistant Lisa Zimmerman took a collective “New Year’s Resolution” and put it into action. Using her experience in other ‘challenge groups’ that helped her reach fitness goals in the past, she decided to put together a daily email and text message group to help the ladies create and reach their goals. She started by sending an email that outlined their goals and included a few motivational tips to get people excited. The emails continued, each day challenging the women to focus on a different aspect of health; from asking how many bottles of water you drank today, to sharing tips on healthy foods to eat. She sent out the invite to all of the women working at the Steele location, six responded to join the group fitness challenge. For all of them, it has given a renewed motivation to get out of bed and make sure they’re getting daily exercise. They have all seen a positive impact on the team morale at work, too. Instead of complaints or gossip, they now ask each other about their goals and progress. For Kris and many of the other ladies, any commitment to New Year’s Resolutions would have been defeated by now. But Lisa’s texts and emails keep them going. “Respect each other and yourself” and “Better the places you live (and work)” are a few of the Choice core values that come to mind for Lisa. “Respect yourself enough to want to fuel your body. And it’s respecting the other people you’re doing this with. You’re here to support them and encourage them,” she said.